We will have the test at the beginning of the timeslot, and will run approximately 18 minutes. As you have learned, all tests in this course are hand-written. Pen or pencil. Answer styles will vary, but we’re mostly looking for short- to medium-length answers, and/or diagrams, and so on. No references or resources are permitted – “closed book, open brain”. More information is on the graded work page. The tested topics are mostly forward-looking. You will be tested on comprehension, understanding, and the application of the current week’s topics. It is possible that you may be tested on a recently-covered topic, which enables you to show that you have the foundational knowledge needed for current and future tasks. As announced last week, the textbook will have a supporting role as you learn new topics from these notes and your classroom sessions. Use the table-of-contents and the index to locate the topic, and then read about it there. A reminder: The textbook does not use view model classes in its discussions and code examples. We do. In the last class, your teacher may have assigned homework, to complete the “pattern summary” quick reference document. Please complete that task, and bring and submit a printed version to class today. We have completed about one-quarter of the course. We hope that you’ve enjoyed it so far. While checking and marking your work, your professor has noticed some good work, but also some indicators of poor scholarship among the work that has earned low grades. This section of the notes has advice on how to improve. Prepare before every class. Your professor expects you to have read and studied the notes, including the linked and recommended readings. You must perform some learning activities before class. You don’t need your professor to verbally dictate content that you can consume better and more efficiently on your own. Therefore, make it a habit to prepare before class. Readings are important. It is impossible to learn what you need to learn in this course, by simply listening to your professor talk for ninety minutes each week. It is also impossible to learn what you need to learn simply by writing code, and ignoring all of the good advice and best practices that are communicated to you through the readings. The way you work through the content is important. Don’t just move your eyes over the content, with the support of a partially-engaged and distracted brain. Instead, read critically, concentrate, and think as you read. Read the difficult or challenging topics out loud (with your speaking voice!). Look up words or terms that are unfamiliar. Open and study the code examples (using Visual Studio), while you are working through the content. Follow the links to the linked material, and work through that too. Write down questions that you need answers to (and follow up by asking your professor or someone else in your support-and-learning network). Review the course content. Every week. How? Schedule a regular time to do this work. You have an appointment calendar on your computer or phone – use it. When? Whatever works for your schedule, but it may be useful to do this activity on Monday or Tuesday, because you will recall techniques and best practices that will be useful as you work on that week’s assignment. Also, it will help you “study” for the regular Thursday test. Review the material in sequence. Two sequences could work: New-to-old, or old-to-new. In other words, you could start with the most recent material, and work backwards, day by day, to the oldest material. Alternatively, you could start with the oldest material, and work forwards to the current material. Is there a benefit to a regular review? Yes. Ask yourself a question, and answer it honestly: Have you ever read something technical for a second (or third) time, and “discovered” the real meaning of something that you know you have read before? The answer will always be “yes”. It’s natural, and it’s part of being human. Some students establish a “study group” with a few classmates. That’s a good practice. Quiz each other. Have each member be responsible for digging deep into a specific topic, and reporting the results to the others. Use the recommended resources. There’s “gold” in the resources. Don’t ignore the resources that you think are too dense, or technical, or boring. Read them. Re-read them. If you begin to read content that’s unfamiliar, or beyond your current level of knowledge or understanding, you should still skim/read it. That way, when you later raise your level of knowledge and understanding, you will remember the material, and can handle it. Do not copy-paste code, hoping that it will work. Write your code without using copy-paste. Later, when you realize that you are writing and repeating the same code as before, then you can consider using copy-paste. And, you should look for opportunities to refactor your code. Understanding the question format is important too. Our questions are conversational in nature. They skew towards applying the knowledge you’re learning. They’re never trivial. The overall goal is to help you become a better explainer, in writing, and verbally. That will pay off in future work/career opportunities. In past weeks, we have been working with single standalone entities. Today, we begin to work with associated entities, and learn the design and coding patterns. Jimmy Bogard released and posted AutoMapper version 4.2 on Wednesday, January 27, 2016. As a result, if you did ran an “update-package” command after that, your existing “CreateMap” statements were marked with a warning (i.e. a green underline) that stated that it was going to be deprecated. For now, don’t worry about that. Your code will continue to work. In the near future, we may adopt the new/updated pattern for declaring (creating) maps. As you begin learning this topic and concept, please remember that we are working with data in memory. While the source of the data is often a database, and the destination is an HTML document, we do not care about those factors. Instead, we focus on working with data in memory. You will often model real-life objects that have associations with other objects, in a one-to-many relationship. “Manufacturer” has a collection of “Vehicle” objects. “Vehicle” is made by a “Manufacturer”. In real life, there are many situations that have a many-to-many association. A “Student” has a collection of “Class” objects. A “Job Duty” (e.g. teacher, coordinator, researcher) can be done by many (a collection) of “Employee” objects. We will cover these kinds of associations in the near future, likely next week. When you are writing entity classes, are associations required between or among all classes? It is not necessary to associate every class to another. This technique is often used for data that is used for lookup or validation purposes. When writing data classes, the associations are simply coded as properties. However, they’re called “navigation properties“. A navigation property has a data type of another class in the model. ALWAYS add a navigation property to both associated classes. Before setting the value of a navigation property, you must have a reference to an object (of that data type). Although you can create a new object in the statement, you will often have another existing variable for (or is a reference to) the object. Important: When you write a statement in code to set one end of the association, do you need to write another statement to set the other end? When we use a persistent store (SQL Server via the Entity Framework), NO, we don’t have to. In this scenario, when you set one end of the association, the persistence framework sets both ends of the association. At this point in time, you have learned how classes can be associated with one another, by using navigation properties. What about view model classes? Well, we use navigation properties in any class that describes a real-world object – design model class, or view model class. Do we add navigation properties to ALL view model classes? Add them only when it makes sense. Often, the “Base” view model class is intended to hold all, or almost all, of the properties defined in the design model class. You may be tempted to add a navigation property to the “Base” class. Resist that temptation. Instead, create another view model class, with the desired navigation property. It’s OK to use inheritance to simplify coding. Let’s look at three scenarios from the code example. The problem domain is a one-to-many association, of recent National Football League playoff teams, and players. A Team has a collection of Players. Conversely, a Player belongs to a Team. This view model class uses the familiar “Base” style, for the Team entity. For clarity, the data annotations were removed. The next view model class uses the familiar “Base” style, for the Player entity. For clarity, the data annotations were removed. While the scenario above is common, sometimes you do not want, or need, the associated object. Instead, you need one or two properties from the associated object. AutoMapper has a feature called “flattening” which helps with this scenario. For example, assume that we want only the Team’s “Name” and “CodeName” properties. Create new properties, with a composite name, Class + Property Name. The data type must match the data type of the property in the design model class. // Design model class name is "Team"
// Property names are "CodeName" and "Name"
This is a good-news story. If you define (create) maps from design model classes to view model classes that have navigation properties, AutoMapper will work the same way that it does for other data types. The scenarios below echo the guidance in the previous section (above). If you have an entity that has an associated (related) collection – for example, a Program has a collection of Subjects, or a Supplier has a collection of Products – you may want to return an object with its associated collection. 1. 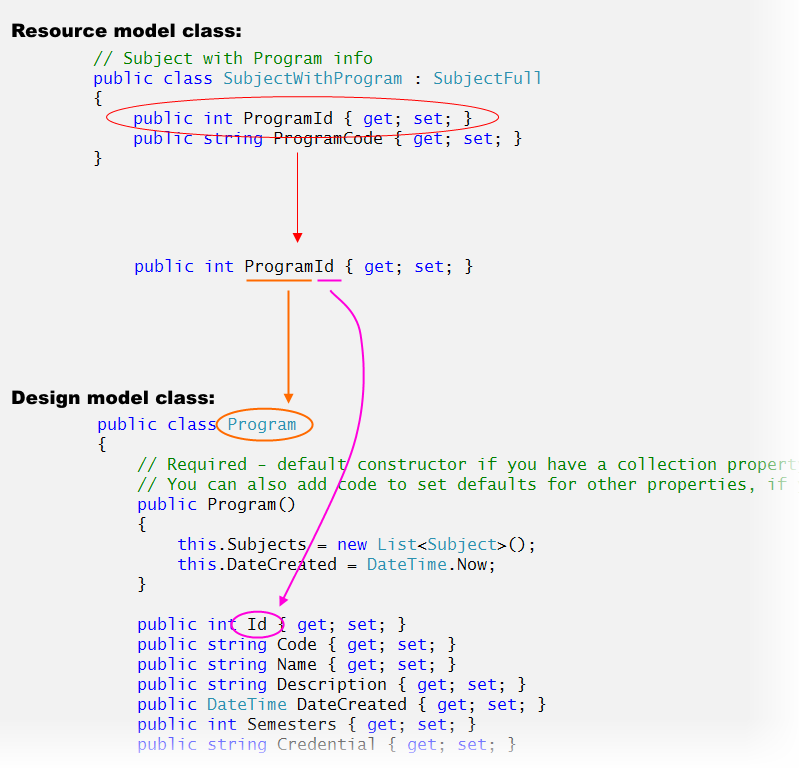 In a new view model class, add a navigation property for the collection. The type is a view model class type. The property name must match the property name in the design model class. 2. Define a map, from the design model class to the new view model class that you created in step 1 above. 3. 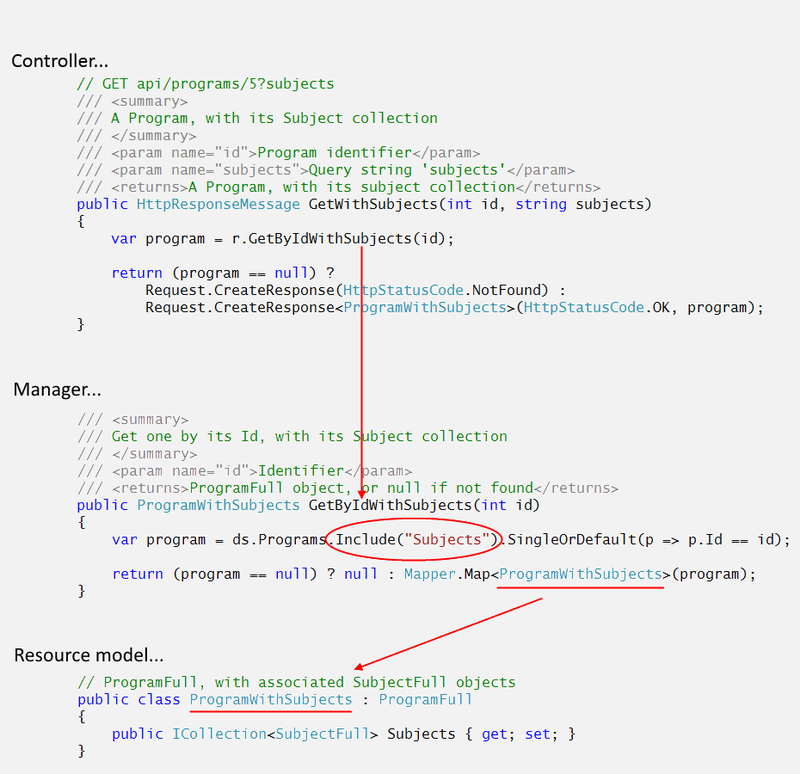 In the manager, when the code fetches the object, add the Include() extension method to fetch its associated collection. 4. In the controller, add a method that will call the manager method. If you have an entity that has an associated entity – for example, a Subject is associated with a single Program – you may want to return an object with its associated object. 1. In a new view model class, add a navigation property for the object. The type is a view model class type. The property name must match the property name in the design model class. 3. In the manager, when the code fetches the object, add the Include() extension method to fetch its associated object. If you have an entity that has an associated object – for example, a Subject belongs to a Program, or a Product belongs to a Supplier – you may want to return individual properties from its associated object. 1. In a new view model class, add a property with a type that matches the property in the associated type. The property name must be a composite of the design model class name and the property name. Study the code example (AssocOneToMany), as you review this section. In a controller method (get all, get one), the code will call a manager method, which will return a package of data that’s described by a view model. For example, the “get one” will return a Team object, that includes a (nested) collection of Player objects. Study the DetailsWithPlayers() method. It passes the fetched object to the view. The view was scaffolded by using the normal/standard Details template. Then, it was edited. The Visual Studio scaffolder will handle simple properties correctly. However, it will not render HTML for all data types. Therefore, we must usually add code to the views. That’s OK, and normal. Cool, yes? For each object in the Players collection, render some HTML. Now, consider the other end of the to-one association. A Player object has a to-one association with a Team object. In other words, a player is on only one team at a time. In the players controller, there are two “get all” players methods that fetch team data. One fetches the Team object itself (…WithTeamInfo), while the other fetches some data, using AutoMapper flattening (…WithTeamName). Each method has its own view. Now, study the …WithTeamName view. The view model class is different from the previous example, in that it has a flattened string property for the team name, instead of the object itself. This section will introduce query techniques, when working with associated data. In this introduction, we will assume that we are working with a one-to-many association. Do you need an object, and its associated object or collection? This work must be done in the Manager class. For example, let’s continue with the objects and collections defined above. What if you need to include data from more than one associated entity? Simply add another Include() method to the query expression. In the following example, assume that we wish to select only those Program objects that include a Subject object with a specific identifier. Let’s build the statement in two steps. By default, when we fetch an object that is related/associated with another object and/or collection, the object that is fetched does not include the related/associated objects. That is the default behaviour of the way we have configured the DbContext object. The range variable – p – represents an object in the Programs collection. Its type is Program. The return type of this statement is IQueryable<TEntity>. then sort the result by the Program object’s Code property value. The following are suggested query strategies for web apps. These are not rules, they’re just suggestions. (And not quite as important as a best practice.) Please be flexible, and balance the needs of the use case with the cost of fulfilling the query. Get all – We do not typically use the Include() method in a “get all” method. The main reason is data volume – it’s possible that the included data will be sizeable in relation to the size of the fetched collection. However, if you really need some or all of an included object, for example, then that may be acceptable. FYI, you can limit the size of the fetched collection by using the Take() method. In addition, there are advanced LINQ query expression components that will result in the generation of an efficient query at the database. Get one – We often use the Include() method in a “get one” method. The included object/collection typically adds good value to the fetched object. Richer strings can be composed, and collection items can be rendered. Again, be flexible. Lazy loading, eager loading – what are these terms? When working with associated data, it is possible to configure the querying settings to use lazy or eager loading, when working with a persistent store (like a database or web service). A query that includes associated data, when using lazy loading, will fetch the desired object or collection. Interestingly, the syntax does NOT require you to use the Include() method in the query expression. In the fetch action, the query will not immediately fetch the associated data. Instead, it will wait for an attempt to access (or dereference) the associated object/collection. When that is detected, a second fetch will execute, and return the associated data automatically. A query that includes associated data, when using eager loading will fetch the desired object or collection, and the associated data. The syntax of the query expression MUST use the Include() method. Sounds like lazy loading offers a pretty good deal, right? Simpler syntax etc. Nope. Not for web apps. Do NOT be tempted to use it, as is suggested sometimes by books and web documents. Why? Interactions with web apps (from a client) follow the HTTP protocol. A request-response cycle is an atomic task, which completes when the response is delivered. The server does not persist request state, in memory, or anywhere else. Therefore, there’s no opportunity for lazy loading to work. Unfortunately, most of the books and web documents “out there” that include coverage of Entity Framework tends to use lazy loading code. For example, the design model classes use the virtual keyword on navigation properties, which is supposed to trigger the lazy loading functionality. However, it’s ineffective and useless for web apps. Don’t use “virtual”.